The first time I was called up to the big leagues was in June of 1996. Of course a big part of the excitement was dreaming about the future. The dream was fueled by an imagination that had run wild since competitive Wiffle ball against my brother. Thoughts of fairways for infields, white pearly baseballs to hit for batting practice, digging into the batter’s box against pitchers that were statues in my mind: Fernando Valenzuela, Dwight Gooden, Orel Hershisher. But in time you look backwards with a new appreciation for the time spent, the lessons learned, the hard knocks of minor league baseball. It is much easier to see those experiences with gratitude when a major league future becomes real. David Bote knows these lessons well. Six years of minor league service to tap. Touching on every level at least once, but mostly more than once. He had years when he had the tough job of trying to explain how playing at every A-ball level in one year is playing for three different teams in three different cities. A-ball can be short-season A, low A, or high A (there is even a middle A, like the Midwest League.) He even had years when he was in Triple-A and A-ball in the same season. Bote’s stats were solid, consistent, steady; adjectives that may cause evaluators to overlook you or ignore you completely, especially when a player does not have the high draft status to garner extra attention. Bote was a player that had quick bat speed and he finally came around at the right time for his opportunity. I played with dozens of minor league players over my career. The vast majority of which did something better than I could, even with my first rounder status. There were plenty with more power, a few with more speed or arm strength, professional baseball life makes you humble enough to realize that in every category there is superior talent. Ego check is daily. By the time I reached Triple-A, most of the players, both teammate and opponent, replaced having a singular stand-out ability with a balance of different skills. You had to know how to play the game by then if you were going to go any higher, unless of course you were anointed or just had undeniable ability and productivity. 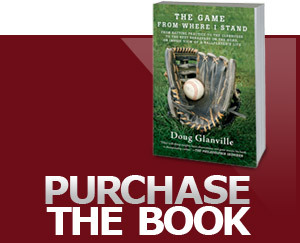 He made it clear that 1,000 hits in the minor leagues was a dubious honor. Whenever we admired him too much he would drop this other line “You want to trade futures?” He knew time was working against him and his steadiness was most likely going to get minimized in the long run. Mike Carter put up the numbers, too. He won the Triple-A batting title with balanced splits in nearly every aspect of offense. In his exit meeting with our manager, he said the manager told him “in every category you did well, your numbers were great across the board.” He never got called up. What stood out about these players was polish. You knew it when you saw it. It was a shiny maturity that comes with experience and allows players to truly know the game well. Ways that don’t make highlight reels or light up a scouts gun. They knew how to slide, they knew where to be on cutoffs and relay, they could bunt, they were an amazing double play combination, they understood how to cut down a slump, they gave advice that was helpful. You come to understand that numbers do not stand alone, but they stand with time. The slow cooking of development that takes place in the minor leagues tells that story. Players that are productive, quick learners with talent (that may be under the radar) usually get better with time. This is not just better in the ways we count, but in qualitative ways, too. Bote is showing strong offensive capability, but it is the completeness that make us wonder how he was not in someone’s starting lineup sooner. He has been a fantastic defender, heads-up baserunner, and shown calm under pressure situations. He has clearly seen a thing or two. When Kris Bryant was sent down after his monster spring in 2015, it caused outrage throughout baseball. It was understandable because of how dominant he was that spring. But he was also a top flight draft pick (1st round), a top prospect and in today’s game, when you have such pedigree and perform superbly even for a short period of time, you are supposed to advance. Teams invested a lot of money in you, you can extend your career the sooner you arrive and create a longer horizons for an organization to be relevant with other young, inexpensive players. So instead of dominating every level over time, you can dominate a situation, a month, a summer, and advance. Yet even with a royal baseball line and a great work ethic, conversely, the “David Bote” big leaguer can have an advantage, the simple wisdom that comes with having to make constant adjustments at every level over a long full minor league seasons (and winter or fall ball.) There is no illusion as to what he must do to earn and sustain a shot, he has to stand out and produce to get an opportunity, every day and in every way. He has to be well-rounded, versatile, patient. He did not have the luxury of draft status or having a singular talent that stops a scout in his tracks. David Bote has been around the block and back. On his journey, he hit every stop, and clearly learned at every corner. And we should never underestimate a player that has had the drive to endure the road to the big leagues one level, one year at a time. We may be waiting for him to come down to earth, but we should consider that part of his excellence is that he had to be rooted on earth from day one. For that, he knew this may be his one and only window. And like any rabid underdog, you will have to close that window on his head if you ever dare try and close it. By then, he may already be on the other side. Republished from NBC Sports Chicago.